In any forklift truck, the part that has the biggest impact on safety, performance and running costs is also the most expensive. It’s the operator. Over the life of your forklift truck, you’ll spend more on operators’ wages than anything else – and with good reason. If your operation is going to be safe, efficient and productive, the driver is your most important investment. The first thing any forklift truck should be is a good place to work – but too many managers dismiss a good cab environment as a luxury. And that’s a huge mistake. When your drivers are uncomfortable, it’s a big distraction – and they tire more quickly, too. That lack of focus reduces performance, while increasing the risk of accidents. A well thought-out cab puts all the controls within arm’s reach, allowing the driver to keep their mind on the job and their eyes on the environment. It also reduces the need for unnecessary movements, which can really add up over a shift, keeping the driver feeling fresher for longer. As simple as it sounds, it’s important to allow plenty of space, too. Statistics show workers across Europe are getting bigger – and a 2014 European Union ruling means employers must make allowances for those who are overweight – so it’s important to choose a forklift truck where everyone can sit comfortably, whatever their size. 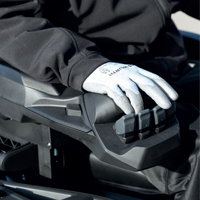 Right: well-designed fingertip controls allow precise operation even in heavy gloves. Mitsubishi were the first to include fingertip control in their forklifts. Today several models feature this, their latest design. With sick pay and – potentially – compensation to think of, good ergonomic design makes sound economic sense. 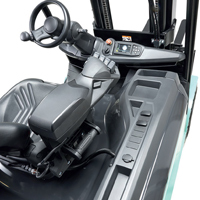 Wherever possible, the driving position should be fully adjustable and supported, as in the full forearm support on many Mitsubishi forklifts, with a full-length armrest that can move in three dimensions. Also look for adjustable seats and steering columns… and save time by choosing a truck that remembers the personal settings for each driver. Pay special attention to reach trucks – where mounting and dismounting the truck over 100 times in a shift can really take its toll on the operator’s joints. Simple touches like wide, non-slip steps, good grab handles and a lower seat position can reduce the strain enormously… And some trucks go further still. When we designed the SENSiA, our latest range of reach trucks, we even created a console that folds away to make things as easy as possible. Visibility is a factor in up to 80% of accidents, so look for a cabin design that gives clear, wide open views all around – as well as a high vision mast, of course. But reducing accident risk doesn’t just protect your workforce. If it happens often enough, minor damage to trucks, racking and stock. It can quickly add up to a huge – and largely uninsured – expense. Working in very tight and confined spaces, it is vital to consider the space within a reach truck’s compartment to ensure it is big enough to protect all of your driver. 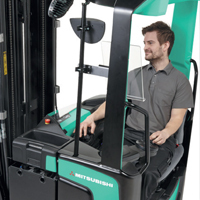 Above: the ingenious design of the Mitsubishi SENSiA reach truck allows the operator easy access to a spacious compartment – while being protected by the truck’s profile.